If anyone knows me they know these two things--I am an unapologetic Democrat and also an apologetic fan of celebrities. Not that these two things have anything to do with each other in Michigan usually, they are just fun facts about me. Like the fact that I hate having breakfast for dinner and I am a huge fan of The Avett Brothers and I love outdoor concerts and hanging out on my front porch. 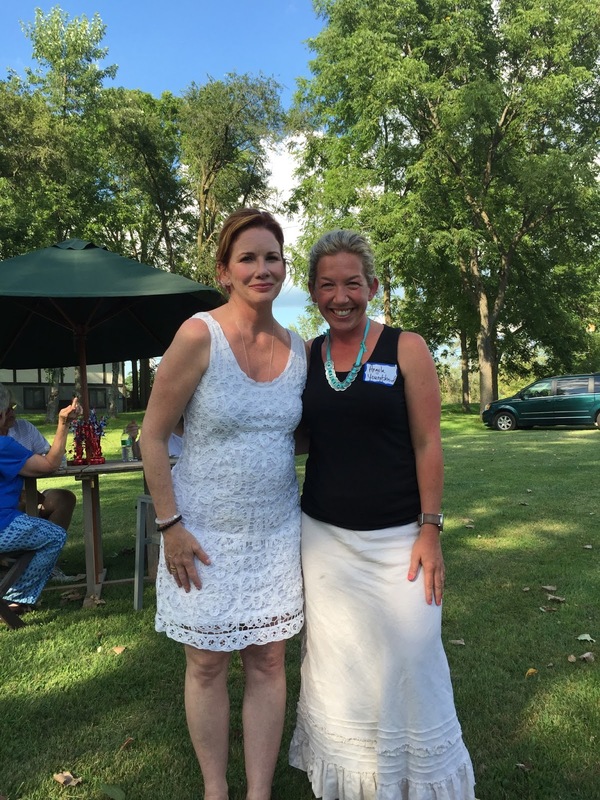 But last weekend, being a Democrat and a celebrity lover got a lot more exciting because I met Melissa Gilbert at a Democratic event. It wasn't some Hollywood soiree because well, duh, I don't go to those. 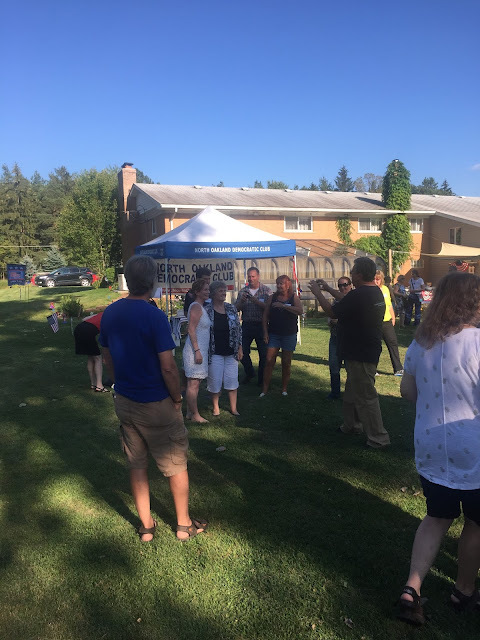 This event was a good old-fashioned political picnic in someone's backyard. I brought Lucy along to get an idea of what local hometown politics look like and to meet Melissa Gilbert who just announced she was running for Congress in Michigan. Lucy wasn't thrilled with any of it. But to be honest, we've sort of entered a pubescent stage where she isn't thrilled with any of my ideas. When we first arrived she wouldn't get out of the car because she didn't know anyone. "It's a backyard full of loving, open-minded people, you know...Democrats, they will love you," I told her. 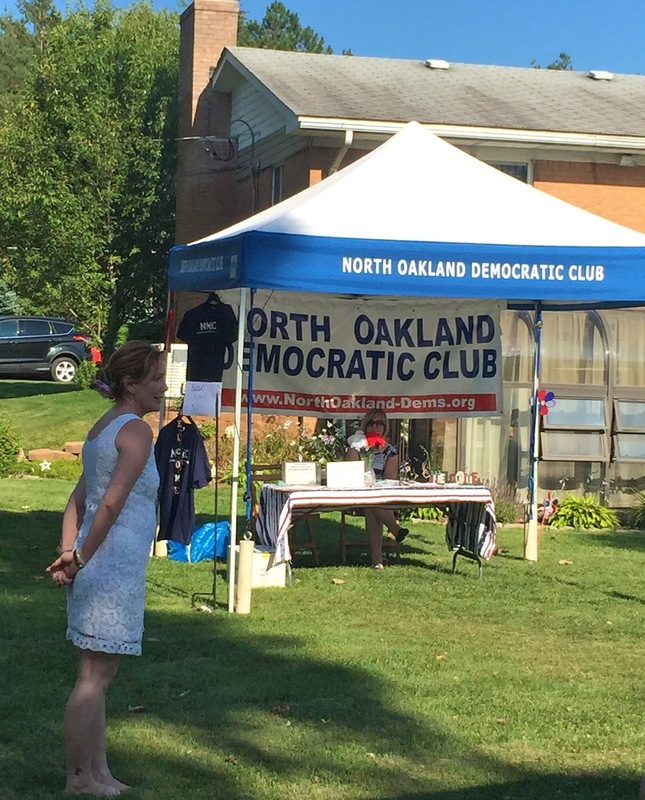 A backyard full of Democrats is one of my favorite places to be. Everyone brought a dish to pass and tried to find a shady spot to sit and visit. And talk about everything from the state of our state and our government to bug spray to how the kids are doing. I hadn't been to one of these in a long time and I hadn't realized how much I missed it. It being the feeling of community, of people caring and being invested and involved and wanting to know more and create change and work together and support each other. So yeah, there I was in the middle of a backyard in a pretty rural part of Michigan having a conversation about blogging and parenting with Melissa Gilbert. It turns out we have a few things in common besides me feeling connected to a character she portrayed in the 1970s. She has a blog. Her last post went viral and she ended up on Dr. Oz's show and yeah that didn't happen to me ever, but we are both bloggers. We are both mothers to boys. We are both married to men named Tim that love Michigan. Her Tim is Timothy Busfield an actor and was on two of my all-time favorite shows "Thirtysomething" and "West Wing." My Tim is Timothy Youngblood an assistant principal of a high school in Metro Detroit. They both loved Michigan so much that she and I share the fact that we moved here to be with them. I moved here 18 years ago. She moved here two years ago. Melissa Gilbert was lovely and kind and relatable. When she found out she was supposed to speak in front of everyone she seemed a little bit nervous. Then she stood in front of the picnic guests and talked about why she wanted to run for Congress. She talked about her experience being president of the Screen Actors Guild. She talked about what issues she's passionate about. She talked about mistakes she made with taxes and explained she is "taking full responsibility for it and paying the money back through a payment plan with the IRS." She talked about her family. She talked about how much she loves Michigan. As she talked, I forgot about "Little House on the Prairie" and Hollywood. I found myself nodding. Melissa Gilbert and I not only share our blogging and husbands with the same name, and the fact that I too had to set up a payment plan once with the IRS after a mistake on our tax return, we share a passion for women's rights, fighting against the defunding of Planned Parenthood, the importance of equal pay and protecting the environment, especially the Great Lakes. Melissa said one of the things she loved about living in Michigan is the feeling of community she's found. Looking around that backyard, I get it. She said the minute she moved to Michigan it felt like home. "I'm a very hard worker," she told the small crowd. "I've been working since I was two-years-old and I hope I can work on behalf of the good people in Michigan." Melissa Gilbert was candid and likable. She got real about mistakes she's made, painful experiences in her family and how she really couldn't have predicted that this is where life would take her. Who knows where life will take us, I never would have predicted hanging out in a back yard with a childhood hero agreeing with her politics. I'm excited. I'm excited that I got a chance to meet her. I'm excited that I get a chance to help her get elected to Congress in my state. "Wasn't that just incredible?," I asked Lucy on our way back to the car. She shrugged in a very teenager-y, unimpressed way. Lucy is young, who knows where life will take her. Hopefully she'll remember this day and see that women can be politicially active and run for office and be mothers and get involved and change directions and have full and vibrant lives in their 40s and 50s and forever. Or she'll become a Republican and write about how her mother dragged her to so many Democratic picnics in people's backyards. Which I'm totally fine with! I just want her to see that she has options and to find a community that supports her and helps her feel like home. Melissa Gilbert's campaign, click here. Amazing on so many levels. I spent my 20's working as a Deputy and then City Clerk which means maintaining a neutral position in public. I spent my 30's in a haze. Now, I can't help but wonder if my 40's will be when I become, as you said, unapologetic and involved. This makes me smile so big for you. I know you were right in your element and I love it.